Snelgrove method for a HTBH. Posted: Wed Feb 05, 2014 5:06 pm Post subject: Snelgrove method for a HTBH. I like Snelgroves method of swarm control, it's effective & not disruptive to the colony. For a year or two I have been thinking how I might apply the technique to a HTBH & think I've come up with the answer. So the bees have built up & will soon be building queen cells. Split the hive as in the image, with the queen on one comb of brood plus all the stores, on the side nearest the main entrance (5) (all other entrances closed) & all the remaining brood at the other end (A), youngest brood nearest the division(follower) board. Any store combs with pollen put in (A). Entrances (3) & (4) corespond to (1) & (2) but at the back of the hive. 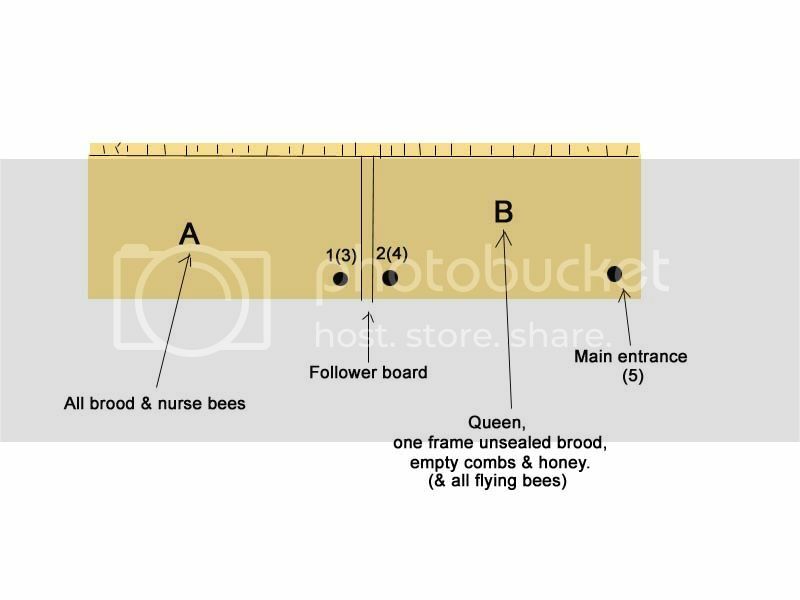 If you modify a follower board so the majority of it's area is open & covered with excluder the nurse bees left in (A) should migrate to the brood in (B), but the queen will not be able to follow. Likewise any flying bees in (A) will migrate to (B). Three or four days later replace the excluder follower with a solid one or better one with some bee-proof mesh so the two colonies can share their scent. At the same time open entrance (1), any flying bees still in (A) will leave via (1) but return via (5). The bees in (A) will need feeding as they have no foragers. If left like this the bees in A will raise queen cells, but as the brood matures & the queens emerge there would be a high risk of cast (secondary) swarms. Also in (B) it will be 21 days for any new brood to emerge & a further three weeks for them to become foragers so the numbers would diminish & storing a surplus unlikely. Both can be countered by bleeding flying bees from (A) to (B). Day 7 or 8 close entrance (1) & open entrances (2) & (3). Bees will leave via (3) but try to return at (1), finding it closed will enter (B) at (2). Day 15 or 16 close entrance (2)& (3) & open entrances (1) & (4) again bleeding bees from (A) to (B). This can bee repeated as often as you like but as the young queens in (A) emerge be sure to allow them time to mate. I haven't put this to practise yet, at least not in a TBH & if you are thinking of trying it yourself I recommend you read Snelgroves own writings on the subject first. 87 views & no comments. Must mean my description is so clear there's no need to comment or so confusing you all think I'm barking! I have read it at least five times and I still don't understand it.. There are much simpler ways to achieve the desired result. It appears more complicated than it is, but really it's just a matter of opening & closing entrances to bleed or drift flying bees away from the brood to the artificial swarm. If there are easier ways to do that then please tell. I'd be delighted to know. Posted: Fri Feb 14, 2014 10:27 am Post subject: Re: Snelgrove method for a HTBH. OK - I just had a go at understanding. Bear in mind that I'm not yet a bee-keeper, apart from briefly having a swarm in a TBH last year (they left again). Hope to get some bees this year. ... the nurse bees left in (A) should migrate to the brood in (B), but the queen will not be able to follow. since the queen is already in (B), and the brood that needs nursing is in (A). And of course, when you're just trying to understand for the first time, it only takes one non-sequitur like this to make you give up. Apart from that, then I see the same features as the Snelgrove Board - two pairs of entrances which are so close together that bees will readily mistake one for the other, yet lead to different 'hives'. As for whether it's too complicated, and a bit of moving and/or rotating (as Phil often suggests) will do just as well, I'm not qualified to say. 1. Don't bother. Let them swarm and catch them or not. 2. Perform a pre-emptive split - easily achieved with central entrances by inserting a follower between two holes and let them work it out. 3. With end-ish entrances - put a follower board somewhere near the middle, some empty comb in the empty side; move the queen on a comb with bees to the empty side; ritate hive through 180 degrees. Flying bees join queen as per swarm, while the others raise a new queen from a cell or egg. Posted: Fri Feb 14, 2014 2:08 pm Post subject: Re: Snelgrove method for a HTBH. think I've come up with the answer. I can see what you are getting at but it seems a really convoluted way to get there. btw I think you could achieve the seem results using just two entrances in the middle (one each side) and followers boards inside the hive with corks so there is a common entrance area. I split a hive three ways last summer & one of the splits (not the one with the original queen) sent out two cast swarms on the same day. All splitting does ir give the old queen more room to lay. But if you make an artificial swarm & reinforce it with the flying bees from the brood the old queen is very unlikely to swarm again (at least not until her broodiest builds up again) & the brood in (A) can't swarm, regardless of the number of queen cells they raise, they have no flying bees to swarm as they are drifted into the old queens quarters. You could do it once, but with just central entrances when you try to repeat the process you will drift bees both ways, A to B & B to A. Like my last answer rotating a hive will work once. Doing it the way I've described will allow you to repeat the process as often as you like. Although as I said before when the new virgin emerges you need to let her mate or risk her joining her mother & being killed. Answer to 1. is as you know not everyone can be around to catch swarms & not everyone has understanding neighbours who will let you clamber through their shrubbery.